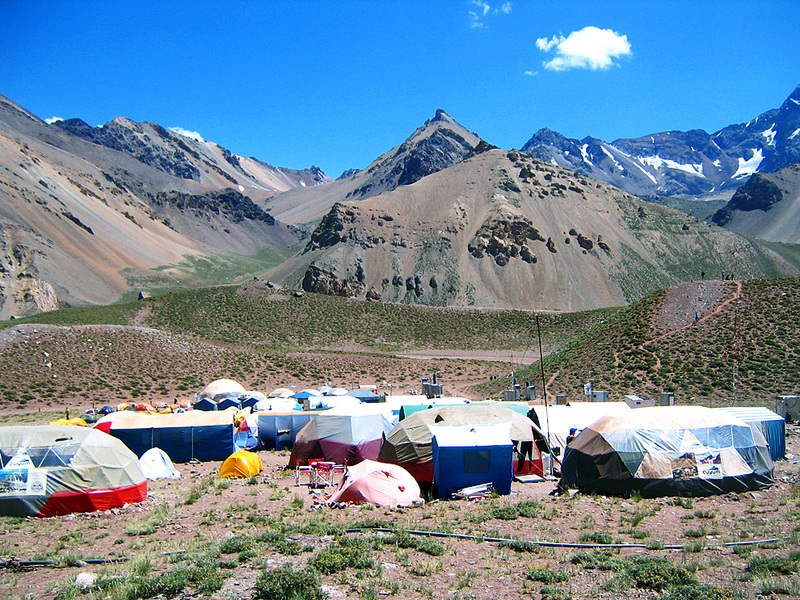 The route from Mendoza to Plaza de Mulas gives a great opportunity to acclimatize but also to enjoy the natural environment. The route from Plaza de Mulas to the summit gives a unique opportunity to experience an extreme high climb in extreme wild nature fully assisted by our specialized staff made up of professional mountain guides and porters. Flexibility in the days around reaching the summit is the key for success. DAY 1: ARRIVE IN MENDOZA. Start of services. Reception and transfer to the hotel. DAY 2: TO PENITENTES. Drive and hostel. DAY 3: TO HORCONES & TREK TO CONFLUENCIA. Trek and shelter in campsite. DAY 4: TOUR TO PLAZA FRANCIA. 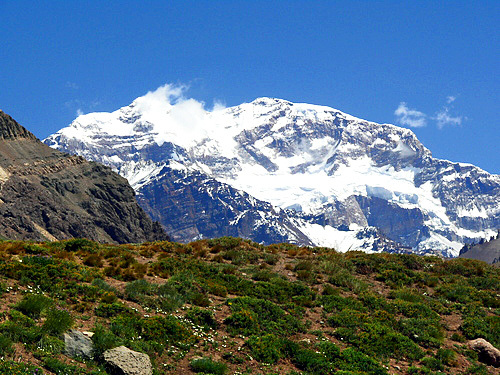 Full day trek to visit the impressive Aconcagua South Face. DAY 5: TO PLAZA DE MULAS. Trek and shelter in campsite. DAY 7: TOUR TO PLAZA CANADA. Walk up to just below 5000 to increase acclimatization. Return to camp. DAY 9: TO PLAZA CANADA. 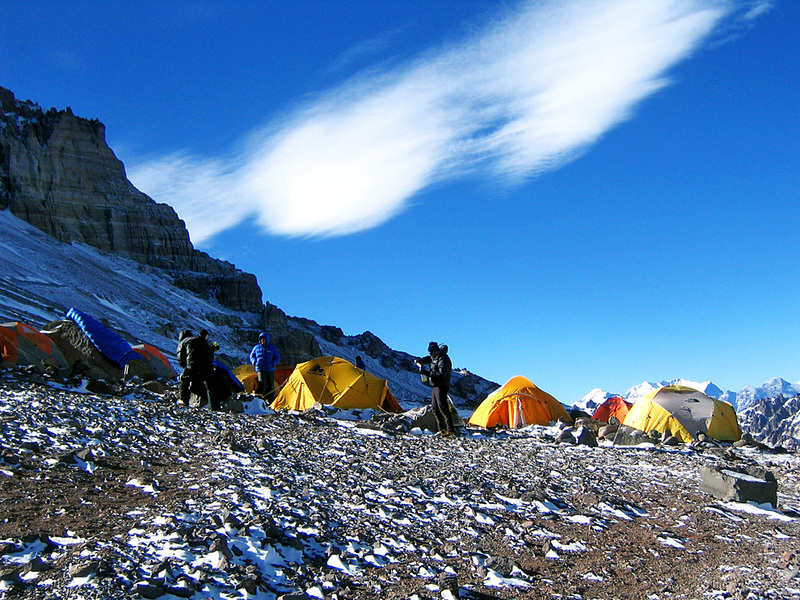 4920 m/16137 ft. Trek and camp. DAY 10: TO NIDO DE CONDORES. 5400 m /17700 ft. Trek and camp. DAY 11: TO CAMPO BERLIN. 5950 m/19516 ft.Trek and camp. 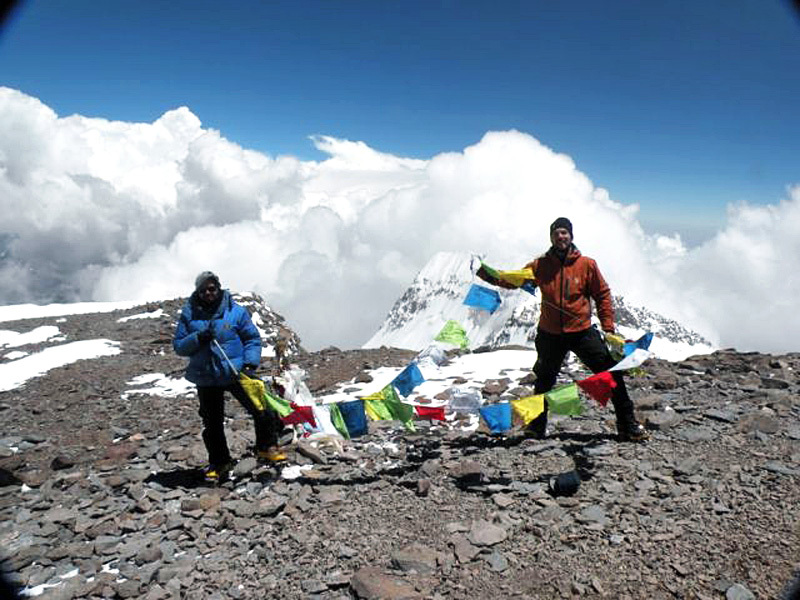 DAY 12: TO SUMMIT OF ACONCAGUA. Trek and snow covered route. Return to camp Nido de Condores. DAY 13: RETURN TO PLAZA DE MULAS. DAY 14: TO HORCONES & MENDOZA. Walk to return to Horcones and drive to return to Mendoza. Hotel. DAY 15: FLY OUT. Breakfast and transfer to the airport to fly out. End of services. DAY 16: Contingency day in case of bad weather. 1rst trip: From 1 December to 16 December. 2nd trip: From 1 January to 16 January. 3rd trip: From 16 January to 31 February. 4th trip: From 3 February to 18 February. BRING: synthetic inner socks, thick socks, trekking shoes, gaiters, thin and thick pants, Gore-Tex trousers, trekking trousers, shirts, turtleneck jumper, fleece jacket, Gore-Tex jacket, rainproof jacket, down jacket, sun hat, woolen bonnet, balaclava, mountain glasses, ski goggles, inner gloves, rainproof gloves, sunscreen, water bottle, thermos, thermarest, hand warmers, head torch, sleeping bag for – 15º C, mountain backpack of 70 liters, mountain double boots, crampons, walking poles, duffel bag.